As the death toll from this week’s collapse of a building that was part of the Nigerian Synagogue Church of All Nations continues to rise, it has emerged that this is not the first time a church structure belonging to the Church has collapsed. According to The Synagogue Church of All Nations (SCOAN) website, the roof of its first church was “blown off by a storm,” the second church was “washed away by a flood,” and the third church “collapsed due to severe weather conditions.” Describing its fourth church building as “an architectural masterpiece,” the website implies, strongly, that each of these occurrences was an act of God. A video showing the collapse of the building (see below) shows several aircraft flying overhead before the five-story structure appears to implode for no apparent reason. The church building that accommodates the auditorium is shown in the photograph above. The building that collapsed is understood to have been an accommodation venue. 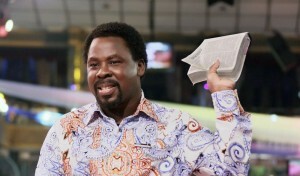 The founder and “general overseer” of The SCOAN is controversial Nigerian Christian minister, televangelist, “prophet” and miracle healer, Temitope Balogun (known as T.B.) Joshua. Born to a life of poverty, he maintains in his official biography that he was called to serve God after being in a trance for three consecutive days. He started the church with seven others many years ago, using a basic shelter in a “squalid, swampy jungle,” as the first church. The second church was more substantial, and the third more substantial still. Joshua has been quoted as saying the collapse of the building linked to the fourth church may have been caused by an attack against the church, identifying the aircraft seen in the video below as one jet that passed the building four times. However, according to contradictory reports, the Lagos State Commissioner for Physical Planning, Mr Toyin Ayinde has confirmed that the building did not have the relevant approval for construction, and that a building permit had not been obtained. According to a Nigerian online newspaper, The Trent, Efe Adelugba, a Nigerian engineering student, predicted the collapse of The SCOAN building in a thesis Things Fall Apart: A Detailed Look At Why Buildings Collapse in 2012. In the article written by Okechukwu Ofili, the claim is that the church building was designed for only two floors – and not five. It stands to reason that when foundations are loaded beyond their ultimate strength they will crack under pressure, and that the structure will collapse. In the same article, they stated that T.B. Joshua himself had told them he had prophesied that a black plane would fly over the building four times and that it would collapse. He did not publicize his prophecy because the aeroplane was not going to crash, and he claimed that he had not been ordained to predict buildings collapsing. The most recent death toll in The SCOAN building collapse is 59, with 131 people reportedly rescued alive.